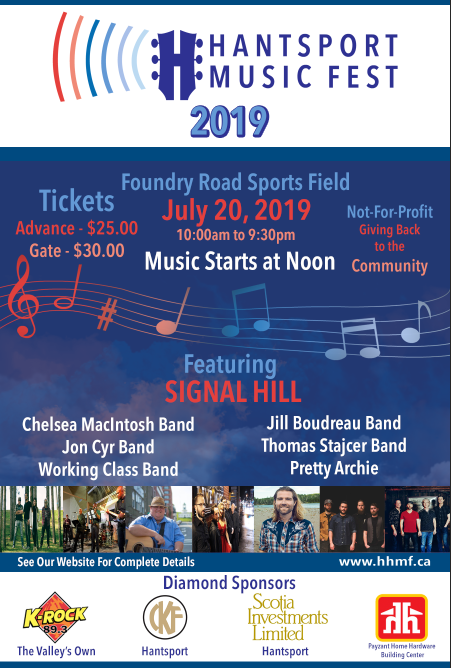 The Hantdport Music Fest is a registered not for profit that works very hard at "Havin A Time"....All profits from the Fest are paid back to the Volunteer groups that work with us, The Hantsport Foodbank, Hantsport Home and School, Hantsport Historical Society, Hantsport Minor Ball, and the Hantsport Memorial Community Center. We work hard at keeping all of our pricing as low as possible from tickets to food. The event is a licensed event with an open bar of Beer, Coolers and Cider. Gates open at 10am and the music starts at Noon. We have 7 great bands that will get your feet tappin. Come see our huge dance floors too. Havin a Time since 2014!